The shadow banking system is a term for the collection of non-bank financial intermediaries that provide services similar to traditional commercial banks but outside normal banking regulations. The phrase "shadow banking" contains the pejorative connotation of back alley loan sharks. Many in the financial services industry find this phrase offensive and prefer the euphemism "market-based finance". This definition was first put forward by PIMCO (Pacific Investment Management Company) executive director Paul McCulley at FED (Federal Reserve System) annual meeting in 2007. "Shadow banking, as usually defined, comprises a diverse set of institutions and markets that, collectively, carry out traditional banking functions — but do so outside, or in ways only loosely linked to, the traditional system of regulated depository institutions. Examples of important components of the shadow banking system include securitization vehicles, asset-backed commercial paper [ABCP] conduits, money market funds, markets for repurchase agreements, investment banks, and mortgage companies"
Shadow banking has grown in importance to rival traditional depository banking, and was a primary factor in the subprime mortgage crisis of 2007-2008 and the global recession that followed. Paul McCulley of investment management firm PIMCO coined the term "shadow banking". Shadow banking is sometimes said to include entities such as hedge funds, money market funds, structured investment vehicles (SIV), "credit investment funds, exchange-traded funds, credit hedge funds, private equity funds, securities broker dealers, credit insurance providers, securitization and finance companies" but the meaning and scope of shadow banking is disputed in academic literature. According to Hervé Hannoun, Deputy General Manager of the Bank for International Settlements (BIS), investment banks as well as commercial banks may conduct much of their business in the shadow banking system (SBS), but most are not generally classed as SBS institutions themselves. (Hannoun 2008) At least one financial regulatory expert has said that regulated banking organizations are the largest shadow banks. The core activities of investment banks are subject to regulation and monitoring by central banks and other government institutions - but it has been common practice for investment banks to conduct many of their transactions in ways that do not show up on their conventional balance sheet accounting and so are not visible to regulators or unsophisticated investors. For example, prior to the 2007-2012 financial crisis, investment banks financed mortgages through off-balance sheet (OBS) securitizations (e.g. asset-backed commercial paper programs) and hedged risk through off-balance sheet credit default swaps. Prior to the 2008 financial crisis, major investment banks were subject to considerably less stringent regulation than depository banks. In 2008, investment banks Morgan Stanley and Goldman Sachs became bank holding companies, Merrill Lynch and Bear Stearns were acquired by bank holding companies, and Lehman Brothers declared bankruptcy, essentially bringing the largest investment banks into the regulated depository sphere. The volume of transactions in the shadow banking system grew dramatically after the year 2000. Its growth was checked by the 2008 crisis and for a short while it declined in size, both in the US and in the rest of the world. In 2007 the Financial Stability Board estimated the size of the SBS in the U.S. to be around $25 trillion, but by 2011 estimates indicated a decrease to $24 trillion. Globally, a study of the 11 largest national shadow banking systems found that they totaled $50 trillion in 2007, fell to $47 trillion in 2008, but by late 2011 had climbed to $51 trillion, just over their estimated size before the crisis. Overall, the worldwide SBS totaled about $60 trillion as of late 2011. In November 2012 Bloomberg reported in a Financial Stability Board report an increase of the SBS to about $67 trillion. It is unclear to what extent various measures of the shadow banking system include activities of regulated banks, such as bank borrowing in the repo market and the issuance of bank-sponsored asset-backed commercial paper. Banks by far are the largest issuers of commercial paper in the United States, for example. As of 2013[update], academic research has suggested that the true size of the shadow banking system may have been over $100 trillion in 2012. According to the Financial Stability Board the sectors size grew to 100 trillion in 2016. Shadow institutions typically do not have banking licenses; they do not take deposits as a depository bank would and therefore are not subject to the same regulations. Complex legal entities comprising the system include hedge funds, structured investment vehicles (SIV), special purpose entity conduits (SPE), money market funds, repurchase agreement (repo) markets and other non-bank financial institutions. Many shadow banking entities are sponsored by banks or are affiliated with banks through their subsidiaries or parent bank holding companies. The inclusion of money market funds in the definition of shadow banking has been questioned in view of their relatively simple structure and the highly regulated and unleveraged nature of these entities, which are considered safer, more liquid, and more transparent than banks. Shadow banking institutions are typically intermediaries between investors and borrowers. For example, an institutional investor like a pension fund may be willing to lend money, while a corporation may be searching for funds to borrow. The shadow banking institution will channel funds from the investor(s) to the corporation, profiting either from fees or from the difference in interest rates between what it pays the investor(s) and what it receives from the borrower. "With the development of the originate-to-distribute model, banks and other lenders are able to extend loans to borrowers and then to package those loans into ABSs, CDOs, asset-backed commercial paper (ABCP) and structured investment vehicles (SIVs). These packaged securities are then sliced into various tranches, with the highly rated tranches going to the more risk-averse investors and the subordinate tranches going to the more adventurous investors." This sector was worth an estimated $60 trillion in 2010, compared to prior FSB estimates of $27 trillion in 2002. While the sector's assets declined during the global financial crisis, they have since returned to their pre-crisis peak except in the United States where they have declined substantially. A 2013 paper by Fiaschi et al. used a statistical analysis based on the deviation from the Zipf distribution of the sizes of the world's largest financial entities to infer that the size of the shadow banking system may have been over $100 trillion in 2012. There are concerns that more business may move into the shadow banking system as regulators seek to bolster the financial system by making bank rules stricter. Like regular banks, shadow banks provide credit and generally increase the liquidity of the financial sector. Yet unlike their more regulated competitors, they lack access to central bank funding or safety nets such as deposit insurance and debt guarantees. (2009 & Hall) In contrast to traditional banks, shadow banks do not take deposits. Instead, they rely on short-term funding provided either by asset-backed commercial paper or by the repo market, in which borrowers in substance offer collateral as security against a cash loan, through the mechanism of selling the security to a lender and agreeing to repurchase it at an agreed time in the future for an agreed price. Money market funds do not rely on short-term funding; rather, they are investment pools that provide short-term funding by investing in short-term debt instruments issued by banks, corporations, state and local governments, and other borrowers. The shadow banking sector operates across the American, European, and Chinese financial sectors,(Boesler 2012) and in perceived tax havens worldwide. Shadow banks can be involved in the provision of long-term loans like mortgages, facilitating credit across the financial system by matching investors and borrowers individually or by becoming part of a chain involving numerous entities, some of which may be mainstream banks. Due in part to their specialized structure, shadow banks can sometimes provide credit more cost-efficiently than traditional banks. A headline study by the International Monetary Fund defines the two key functions of the shadow banking system as securitization – to create safe assets, and collateral intermediation – to help reduce counterparty risks and facilitate secured transactions. In the US, prior to the 2008 financial crisis, the shadow banking system had overtaken the regular banking system in supplying loans to various types of borrower; including businesses, home and car buyers, students and credit users. As they are often less risk averse than regular banks, entities from the shadow banking system will sometimes provide loans to borrowers who might otherwise be refused credit. Money market funds are considered more risk averse than regular banks and thus lack this risk characteristic. Leverage is considered to be a key risk feature of shadow banks, as well as traditional banks. Leverage is the means by which shadow banks and traditional banks multiply and spread risk. Money market funds are completely unleveraged and thus do not have this risk characteristic. The recommendations for G20 leaders on regulating shadow banks were due to be finalised by the end of 2012. The United States and the European Union are already considering rules to increase regulation of areas like securitisation and money market funds, although the need for money market fund reforms has been questioned in the United States in light of reforms adopted by the Securities and Exchange Commission in 2010. The International Monetary Fund suggested that the two policy priorities should be to reduce spillovers from the shadow banking system to the main banking system and to reduce procyclicality and systemic risk within the shadow banking system itself. Many "shadow bank"-like institutions and vehicles have emerged in American and European markets, between the years 2000 and 2008, and have come to play an important role in providing credit across the global financial system. In a June 2008 speech, Timothy Geithner, then President and CEO of the Federal Reserve Bank of New York, described the growing importance of what he called the "non-bank financial system": "In early 2007, asset-backed commercial paper conduits, in structured investment vehicles, in auction-rate preferred securities, tender option bonds and variable rate demand notes, had a combined asset size of roughly $2.2 trillion. Assets financed overnight in triparty repo grew to $2.5 trillion. Assets held in hedge funds grew to roughly $1.8 trillion. The combined balance sheets of the then five major investment banks totaled $4 trillion. In comparison, the total assets of the top five bank holding companies in the United States at that point were just over $6 trillion, and total assets of the entire banking system were about $10 trillion." In 2016, Benoît Cœuré (ECB executive board member) stated that controlling shadow banking should be the focus to avoid a future financial crisis, since the banks' leverage had been lowered. Shadow institutions are not subject to the same prudential regulations as depository banks, so that they do not have to keep as high financial reserves relative to their market exposure. Thus they can have a very high level of financial leverage, with a high ratio of debt relative to the liquid assets available to pay immediate claims. High leverage magnifies profits during boom periods and losses during downturns. This high leverage will also not be readily apparent to investors, and shadow institutions may therefore be able to create the appearance of superior performance during boom times by simply taking greater pro-cyclical risks. Money market funds have zero leverage and thus do not pose this risk feature of shadow banks. Shadow institutions like SIVs and conduits, typically sponsored and guaranteed by commercial banks, borrowed from investors in short-term, liquid markets (such as the money market and commercial paper markets), so that they would have to repay and borrow again from these investors at frequent intervals. On the other hand, they used the funds to lend to corporations or to invest in longer-term, less liquid (i.e. harder to sell) assets. In many cases, the long-term assets purchased were mortgage-backed securities, sometimes called "toxic assets" or "legacy assets" in the press. These assets declined significantly in value as housing prices declined and foreclosures increased during 2007–2009. In the case of investment banks, this reliance on short-term financing required them to return frequently to investors in the capital markets to refinance their operations. When the housing market began to deteriorate and their ability to obtain funds from investors through investments such as mortgage-backed securities declined, these investment banks could not refinance themselves. Investor refusal or inability to provide funds via the short-term markets was a primary cause of the failure of Bear Stearns and Lehman Brothers during 2008. From a technical standpoint, these institutions are subject to market risk, credit risk and especially liquidity risk, since their liabilities are short term while their assets are more long term and illiquid. This creates a problem, as they are not depositary institutions and do not have direct or indirect access to the support of their central bank in its role as lender of last resort. Therefore, during periods of market illiquidity, they could go bankrupt if unable to refinance their short-term liabilities. They were also highly leveraged. This meant that disruptions in credit markets would make them subject to rapid deleveraging, meaning they would have to pay off their debts by selling their long-term assets. A sell off of assets could cause further price declines of those assets and further losses and selloffs. In contrast to investment banks, money market funds do not go bankrupt—they distribute their assets (which are mainly short-term) pro rata to shareholders if their net asset value falls below $.9995 per share. Only two funds ever have failed to pay investors $1.00 per share. The Reserve Primary Fund paid $.99 per share to its shareholders and another fund paid its shareholders $.96 per share in 1994. The securitization markets frequently tapped by the shadow banking system started to close down in the spring of 2007, with the first failure of auction-rate offerings to attract bids. As excesses associated with the U.S. housing bubble became widely understood and borrower default rates rose, residential mortgage-backed securities (RMBS) deflated. Tranched collateralized debt obligations (CDOs) lost value as default rates increased beyond the levels projected by their associated agency credit ratings. Commercial mortgage-backed securities suffered from association and from a general decline in economic activity, and the entire complex nearly shut down in the fall of 2008. More than a third of the private credit markets thus became unavailable as a source of funds. In February 2009, Ben Bernanke stated that securitization markets remained effectively shut, with the exception of conforming mortgages, which could be sold to Fannie Mae and Freddie Mac. U.S. Treasury Secretary Timothy Geithner has stated that the "combined effect of these factors was a financial system vulnerable to self-reinforcing asset price and credit cycles." In January 2012, the global Financial Stability Board announced its intention to further regulate the shadow banking system, in the interests of the real economy. The term "shadow banking system" is attributed to Paul McCulley of PIMCO, who coined it at Federal Reserve Bank of Kansas City's Economic Symposium in Jackson Hole, Wyoming in 2007 where he defined it as "the whole alphabet soup of levered up non-bank investment conduits, vehicles, and structures." McCulley identified the birth of the shadow banking system with the development of money market funds in the 1970s – money market accounts function largely as bank deposits, but money market funds are not regulated as banks. The concept of hidden high priority debt dates back at least 400 years to Twyne's case and the Statute of Bankrupts (1542) in the UK, and to Clow v. Woods in the U.S. These legal cases led to the development of modern fraudulent transfer law. The characteristic peculiarity of these forms of credit is that they spring up without being subject to any central control, but once they have come into existence their convertibility into other forms of money must be possible if a collapse of credit is to be avoided. The full extent of the shadow banking system was not widely recognised until work was published in 2010 by Manmohan Singh and James Aitken of the International Monetary Fund, showing that when the role of rehypothecation was considered, in the U.S. the SBS had grown to over $10 trillion, about twice as much as previous estimates. During 1998, the highly leveraged and unregulated hedge fund Long-Term Capital Management failed and was bailed out by several major banks at the request of the government, which was concerned about possible damage to the broader financial system. Structured investment vehicles (SIVs) first came to public attention at the time of the Enron scandal. Since then, their use has become widespread in the financial world. In the years leading up to the crisis, the top four U.S. depository banks moved an estimated $5.2 trillion in assets and liabilities off their balance sheets into special purpose vehicles (SPEs) or similar entities. This enabled them to bypass regulatory requirements for minimum capital adequacy ratios, thereby increasing leverage and profits during the boom but increasing losses during the crisis. New accounting guidance was planned to require them to put some of these assets back onto their books during 2009, with the effect of reducing their capital ratios. One news agency estimated the amount of assets to be transferred at between $500 billion and $1 trillion. This transfer was considered as part of the stress tests performed by the government during 2009. The market in CDS, for example, was insignificant in 2004 but rose to over $60 trillion in a few years. Because credit default swaps were not regulated as insurance contracts, companies selling them were not required to maintain sufficient capital reserves to pay potential claims. Demands for settlement of hundreds of billions of dollars of credit default swaps contracts issued by AIG, the largest insurance company in the world, led to its financial collapse. Despite the prevalence and volume of this activity, it attracted little outside attention before 2007, and much of it was off the balance sheets of the contracting parties' affiliated banks. The uncertainty this created among counterparties contributed to the deterioration of credit conditions. Since then the shadow banking system has been blamed for aggravating the subprime mortgage crisis and helping to transform it into a global credit crunch. The shadow banking system has been implicated as significantly contributing to the global financial crisis of 2007–2012. In a June 2008 speech, U.S. Treasury Secretary Timothy Geithner, then President and CEO of the New York Federal Reserve Bank, placed significant blame for the freezing of credit markets on a "run" on the entities in the shadow banking system by their counterparties. The rapid increase of the dependency of bank and non-bank financial institutions on the use of these off-balance sheet entities to fund investment strategies had made them critical to the credit markets underpinning the financial system as a whole, despite their existence in the shadows, outside of the regulatory controls governing commercial banking activity. Furthermore, these entities were vulnerable because they borrowed short-term in liquid markets to purchase long-term, illiquid and risky assets. This meant that disruptions in credit markets would make them subject to rapid deleveraging, selling their long-term assets at depressed prices. Economist Paul Krugman described the run on the shadow banking system as the "core of what happened" to cause the crisis. "As the shadow banking system expanded to rival or even surpass conventional banking in importance, politicians and government officials should have realized that they were re-creating the kind of financial vulnerability that made the Great Depression possible—and they should have responded by extending regulations and the financial safety net to cover these new institutions. Influential figures should have proclaimed a simple rule: anything that does what a bank does, anything that has to be rescued in crises the way banks are, should be regulated like a bank." He referred to this lack of controls as "malign neglect." One former banking regulator has said that regulated banking organizations are the largest shadow banks and that shadow banking activities within the regulated banking system were responsible for the severity of the financial crisis. ^ "Bloomberg - Are you a robot?". ^ Bernanke, Ben S (8 November 2013). "The Crisis as a Classic Financial Panic". At the Fourteenth Jacques Polak Annual Research Conference, Washington, D.C.: Board of Governors of the Federal Reserve System. Retrieved 8 March 2016. ^ a b c d e f g Bryan Noeth & Rajdeep Sengupta (2011). "Is Shadow Banking Really Banking?". The Regional Economist, Federal Reserve Bank of St. Louis. October: 8–13. ^ Krugman, Paul (April 8, 2016). "Sanders Over the Edge". The New York Times. The New York Times. Retrieved April 9, 2016. ^ a b Huw Jones (29 August 2013). "'Shadow' banks face 2015 deadline to comply with first global rules". Reuters. Retrieved 29 August 2013. ^ a b Hervé Hannoun (21 March 2008). Financial deepening without financial excesses (PDF). 43rd SEACEN Governors’ Conference. Jakarta. p. 8. Retrieved 30 April 2012. ^ Schiller, Robert, Finance and the Good Society, Princeton University Press (2012), ISBN 0-691-15488-0. Schiller argued that both Lehman Brothers and Bear Stearns were shadow banks due to the extent of their involvement in the SBS. ^ a b Melanie L. Fein (15 February 2013). "The Shadow Banking Charade". SSRN. SSRN 2218812. ^ a b c d e f g h i j Michael Simkovic (2009). "Secret Liens and the Financial Crisis of 2008". American Bankruptcy Law Journal. 83: 253. SSRN 1323190. ^ a b Masters, Brook, Shadow banking surpasses pre-crisis level, The Financial Times, ft.com, 2011-10-27. Accessed 2012-01-16. ^ "Chapter 2 Shadow Banking". Financial Crisis Inquiry Commission Report (PDF) (Report). The Financial Crisis Inquiry Commission. January 2011. Retrieved 12 October 2012. ^ a b "Shadow Banking: Strengthening Oversight and Regulation" (PDF) (Press release). Financial Stability Board. 27 October 2011. Retrieved 11 September 2012. 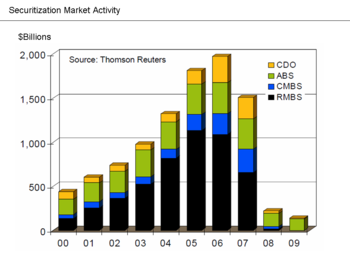 ^ Brunsden, Jim & Moshinsky, Ben, Shadow Banking Grows to $67 Trillion Industry, Regulators Say, Bloomberg, 2012-11-19. Accessed 2012-11-28. ^ a b "The True Size of the Shadow Banking System Revealed (Spoiler: Humongous)". Medium.com. 27 September 2013. ^ Jones, Huw. "World's 'shadow banks' continue to expand". U.S. Retrieved 2018-08-01. ^ Pozsar, Zoltan; Adrian, Tobias; Ashcraft, Adam; Boesky, Hayley (July 2012). "Shadow Banking" (PDF). Federal Reserve Bank of New York. Retrieved 19 September 2012. ^ Brooke Masters (27 October 2011). "Shadow banking surpasses pre-crisis level". Financial Times. Retrieved 11 September 2012. ^ a b c d e f g h Michelle Martin (7 February 2012). "Q+A - What is shadow banking and why does it matter?". Reuters. Retrieved 19 September 2012. ^ Davide Fiaschi; Imre Kondor; Matteo Marsili (2013). "The Interrupted Power Law and the Size of Shadow Banking". PLOS ONE. 9 (4): e94237. arXiv:1309.2130. doi:10.1371/journal.pone.0094237. PMC 3984121. PMID 24728096. ^ Robert E. Hall; Marc Lieberman (2009). Economics: Principles and Applications. South-Western College. pp. 381–383. ISBN 978-1439038963. ^ Antoine Bouveret (6 July 2011). "An Assessment of the Shadow Banking Sector in Europe". Observatoire Français des Conjonctures Economiques. SSRN 2027007. ^ Matthew Boesler (18 July 2012). "Should we be worried about China's $2.2-trillion shadow banking system?". Financial Post. National Post. Retrieved 19 September 2012. ^ a b "Shadow Banking: Economics and Policy" (PDF). International Monetary Fund. Retrieved 2013-02-18. ^ Robert E. Hall and Marc Lieberman (2009). Economics: Principles and Applications. South-Western College. p. 791. ISBN 978-1439038963. ^ a b Tett, Gillian, and Davies, Paul J., Out of the shadows: How banking’s secret system broke down, The Financial Times, ft.com, 2007-12-16, 18:33. ^ a b c Geithner, Timothy, Reducing Systemic Risk in a Dynamic Financial System, speech transcript, delivered 2008-6-9, The Economic Club of New York, New York City, via newyorkfed.org. The term "shadow" appears nowhere in transcript. ^ Mark Schrörs and Detlef Fechtner (2016-12-20). "Interview with Benoît Cœuré, Member of the Executive Board of the ECB". History teaches us that, always and everywhere, asset price bubbles were accompanied by high leverage. That is not the case now, because banks’ balance sheets are smaller. That reduces the amount of risk in the financial system. Where we need to be particularly vigilant is with regard to market-based finance, also known as shadow banking. We need to gather the right information and we may need new instruments to make sure that the next big crisis does not come from the shadow banking system. ^ Roubini, Nouriel, The Shadow Banking System is Unraveling, The Financial Times, ft.com, 2008-9-21. Accessed 2012-4-30. ^ Gelinas, Nicole, Can the Fed's Uncrunch Credit?, City Journal, city-journal.org, v. 19, no. 1, Winter 2009. Accessed 2012-4-30. ^ Bernanke, Ben, Bernanke Testimony, Semiannual Monetary Policy Report to the Congress, Board of Governors of the Federal Reserve System, federalreserve.gov, 2009-02-24. Accessed 2012-4-30. ^ Masters, Brook, FSB chief in call to rein in ‘shadow banking’, The Financial Times, 2012-01-15. Accessed 2012-01-16. ^ McCulley, Paul, Teton Reflections, pimco.com, August/September 2007. ^ Gross, Bill, Beware our shadow banking system, CNN, cnn.com, 2007-11-28. ^ McCulley, Paul, Comments Before the Money Marketeers Club: Playing Solitaire with a Deck of 51, with Number 52 on Offer, pimco.com, 2009-3-19, via archive.org. Accessed 2012-4-30. ^ McCulley, Paul, After the Crisis: Planning a New Financial Structure: Learning from the Bank of Dad, pimco.com, 2010-4-15, via archive.org. Accessed 2012-4-30. ^ Clow v. Woods, 5 S. & R. 275 (1819). ^ Hayek, Friedrich, Prices and Production, 1935. See also Chasing The Shadow Of Money, Zero Hedge, 2009-5-17. ^ Singh, Manmohan, and Aitken, James, The (sizable) Role of Rehypothecation in the Shadow Banking System, International Monetary Fund, imf.org, 2010-07-01. Accessed 2010-08-31. ^ Tett, Gillian, Web of shadow banking must be unravelled, The Financial Times, ft.com, 2010-08-12. Accessed 2010-08-31. ^ Lowenstein, Roger, When Genius Failed: The Rise and Fall of Long-Term Capital Management, Random House, 2000. ISBN 0-375-50317-X. ^ Reilly, David, Bloomberg-Banks $1 trillion purge, Bloomberg News, bloomberg.com, 2009-3-25. Accessed 2012-4-30. ^ a b BIS, Credit Risk Transfer Developments from 2005 to 2007, The Joint Forum, Bank for International Settlements, bis.org, 2008-7-31. Accessed 2012-4-30. ^ Blackburn, Robin, The Subprime Crisis, The New Left Review, newleftreview.org, pp. 63 et seq., March/April, 2008. Accessed 2012-4-30. ^ a b Simkovic, Michael, Competition and Crisis in Mortgage Securitization, 2011-10-8, Indiana Law Journal, Vol. 88, 2013 (forthcoming). ISSN 0019-6665. ^ Harvey, David, The Enigma of Capital: And the Crises of Capitalism. Oxford: Oxford University Press, 2010. ISBN 978-0-19-975871-5. ^ Gorton, Gary, Slapped by the Invisible Hand: The Panic of 2007, 2010. ISBN 978-0-19-973415-3. ^ Krugman, Paul, The Return of Depression Economics and the Crisis of 2008, W. W. Norton & Company, 2009. ISBN 978-0-393-07101-6. ^ Lambin, J., Rethinking the Market Economy: New Challenges, New Ideas, New Opportunities (London: Palgrave Macmillan, 2014), p. 21. ^ Melanie L. Fein (30 March 2012). "Shooting the Messenger: The Fed and Money Market Funds". SSRN. SSRN 2021652. Shadow Banking 2010 report (revised 2012) on the SBS from the Federal Reserve Bank of New York with a detailed diagram of the system.